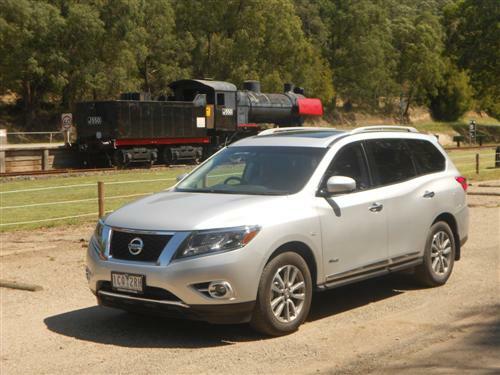 Nissan joins the hybrid vehicle market in Australia with a vehicle quite suitable for a hybrid power source - a large SUV. Offered in either two- or four-wheel drive, the new generation Nissan Pathfinder is now available in a hybrid version in addition to a petrol-fuelled variant. A diesel engine is no longer offered. The test car was the Nissan Pathfinder ST-L Hybrid. Our drive car, the mid-spec model was equipped with four-wheel drive and the hybrid power source. The starting price for this version (without options) is from $57,490*. 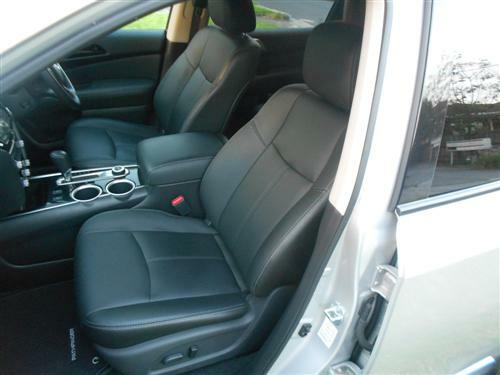 The test car was fitted with an option pack (at $2,100*) that included 'around view', satellite navigation and enhancements to the audio system and for the 'connectivity' of the car. Premium paint was part of the presentation too, this being an option (at $495*). 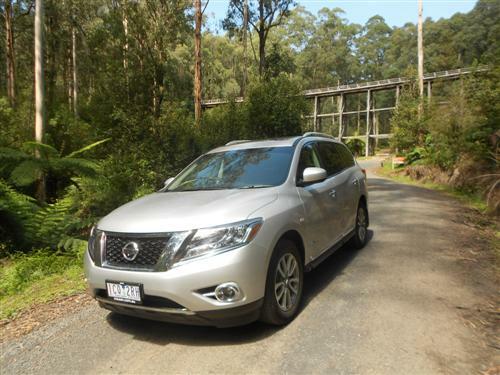 The Nissan Pathfinder comes along in three trim levels - ST, ST-L and Ti - each with a petrol-fuelled 3.5 litre V6 with all versions available in either two-wheel drive or all-wheel drive. A hybrid model comes in 2WD in ST trim and as a AWD in ST-L and Ti guise. The hybrid has a 2.5 litre supercharged petrol-fuelled four-cylinder engine and a 15kW electric motor. 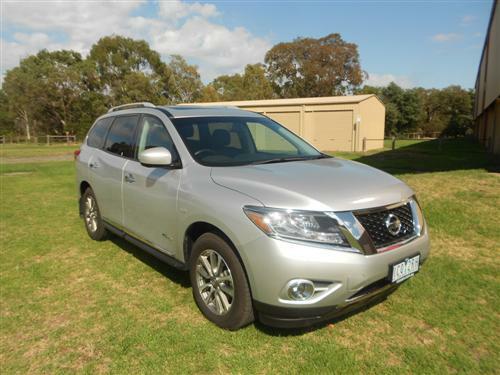 Prices* start from a very reasonable $39,990* for the 2WD 3.5 litre Pathfinder ST, whilst the AWD version of the 3.5 litre V6 ST commence from $44,490* (another good starting price). The ST Hybrid with 2WD is priced from $42,990*. ST-L V6 prices* begin at $50,490* and $54,990* (2WD and AWD respectively). The ST-L Hybrid AWD is priced from $57,490*. Top of the line Pathfinder Ti models are offered from $60,990* (Ti AWD 3.5 litre), $65,090* (Ti AWD 3.5 V6) and $68,090* (Ti AWD Hybrid). Hence, a good selection of models is available covering a staggering price range from $39,990* to $68,090*. 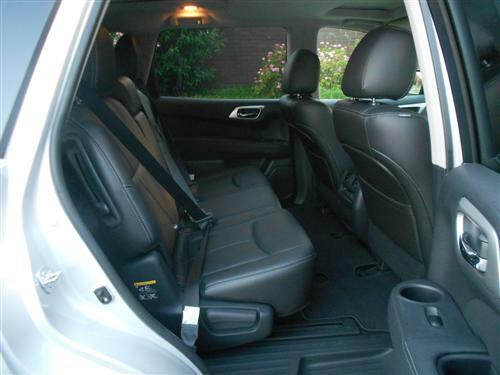 A big car usually has a nice ride on offer and we found that that was certainly the case with this latest generation Pathfinder. We were impressed by the smooth performance provided by the hybrid power supply. 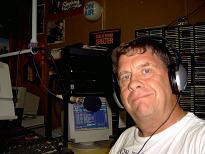 Likewise, the quiet cabin was a satisfying environment with plenty of space. We managed to get onto plenty of "B" and "C" roads during our drive time. The twists and turns in hilly territory plus the typical rough edges and patched up surfaces of Victoria's C roads remained comfortable. On freeways and modern day highways this Nissan Pathfinder was a very pleasing piece of machinery. The hybrid wasn't complicated and, in my opinion, any fear or hesitation with choosing a hybrid belongs in the past. If you weren't told that this car was a hybrid then you probably would believe it to be a nicely presented large SUV that has admirable driving qualities with pleasing performance. So, clearly, the Nissan Pathfinder in its new generation is well suited to playing the part of a nice SUV of the larger variety. It has lost its tough off-roading 4x4 'character'. We drove 419 kilometres in and around Melbourne, the Yarra Valley and West Gippsland to give the car a good run! Pathfinder ST-L Hybrid is an all-wheel drive SUV. The combined power is a maximum of 188kW at 5,600rpm and there is a maximum of 330Nm of torque at 3,600rpm. A CVT automatic transmission is standard and it operates quite well. It's just another one of the factors that made the test car a pleasing drive. Independent suspension is fitted at each wheel. Brakes are discs all around and the parking brake is a love it or hate it foot-operated device. Eighteen inch alloy wheels are standard for the ST-L AWD Hybrid. The spare wheel is the space-saver type. The fuel consumption rating for this hybrid SUV is 8.5 litres per 100 kilometres (combined cycle). This compares favourably with the 10.2 rating of the ST-L AWD petrol model if you clock up a good few kilometres each year. The fuel tank capacity is 73 litres. 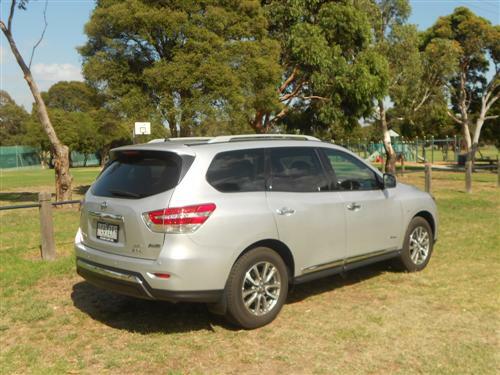 Six airbags and a reversing camera are included with the Pathfinder ST-L Hybrid. The 'around view' system, which is part of an optional pack, is an interesting device because of the view around the close vicinity of the car. This is especially handy for those who make a habit of parking in particularly tight parking spaces. Of course, this device cannot determine when a 'moving target' is close so it is essential that the driver maintains a very close eye on the surroundings. The system does not see hip high pipes mounted on walls or overhanging bushes as the cameras are mounted to gain a view of the ground only - a great device though, it is much more than a novelty! Tare weight: 2,073 kg (approx). 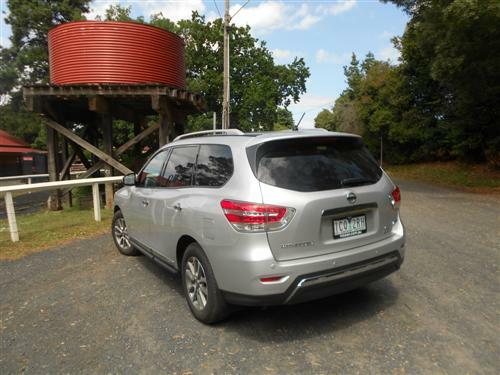 An appropriately equipped Pathfinder Hybrid can tow 1,650kg (trailer and its load). 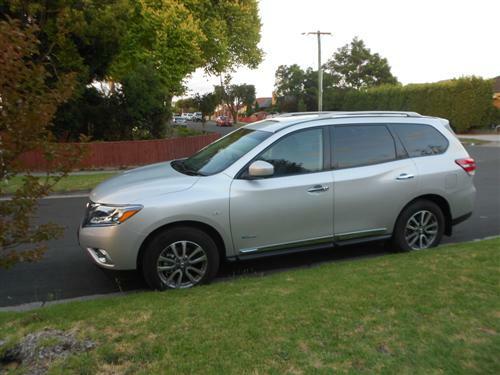 Nissan covers the Pathfinder Hybrid with a 3 year/100,000 kilometre warranty (conditions apply). Roadside assistance is there for the warranty period too (conditions apply). Capped price servicing is available at Nissan dealers (again, conditions apply). The conservatively styled Nissan Pathfinder ST-L Hybrid with the options as per the test car is a well equipped and particularly pleasing SUV. Make no mistake though, it is a big car but it has the qualities that are admired in such vehicles - plenty of room and good ride qualities. Nissan's repositioning of the new generation Pathfinder to take advantage of the continuing boom in SUV sales is a good move. There being a greater demand for SUVs than 4x4 wagons means Nissan has a product to please more people - and that's what it is all about.